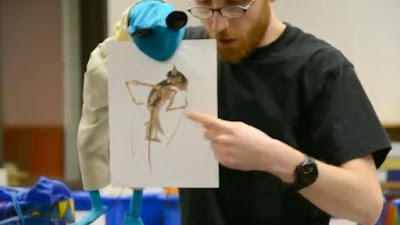 Lately I've been trying to find ways I can improve my children's puppetry workshops. But as with Mr. Punch a few years ago, it occurred to me that I ought to have a real shadow puppet to show them. Why pay me to show them a photograph? I enlarged that picture (identified as Sita from the Ramayana) and cut it out. Then I traced it onto card stock and cut out the body, the two upper arms, and the two forearms/hands. 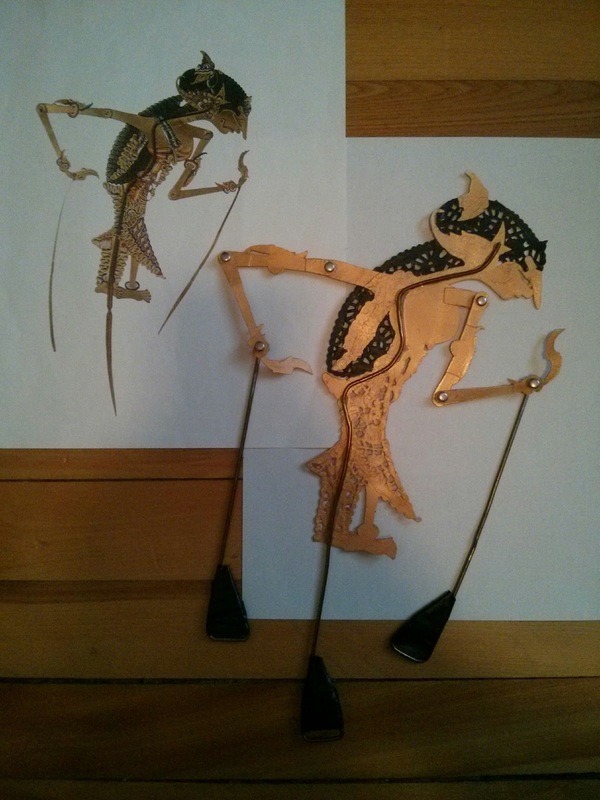 In my research, I came across this picture from GreenerBali.com and saw that these puppets have a lot of internal detail. Some things, like the eye, I cut out myself, along with holes in the shoulders, elbows, and wrists to create joints. But for the rest, the solution (as suggested in this post by blogger That Artist Woman) was to use paper doilies. I bought some that were the right size to have the same curvature as the relevant parts of the puppet. I cut out the parts of Sita's body that needed detail, leaving a narrow border around the edge to maintain the proper shape. 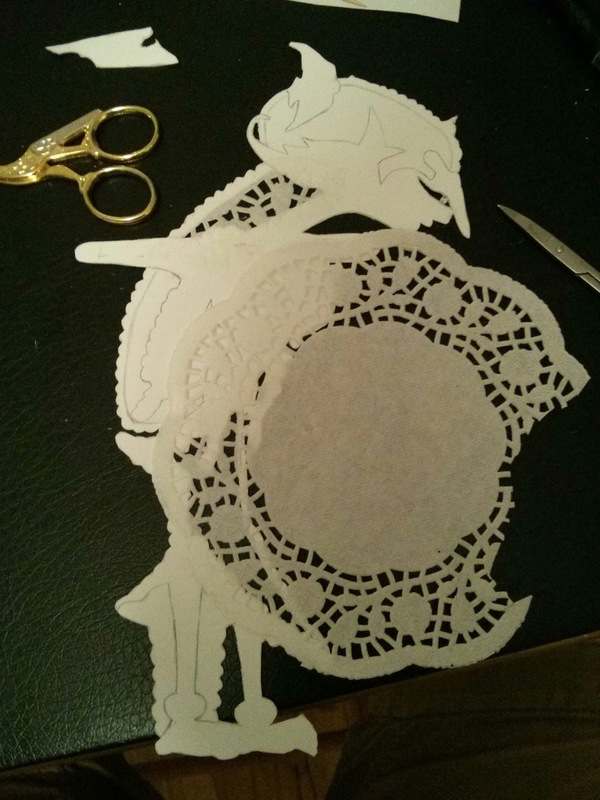 Then I placed each doily in the position where the holes in the doily corresponded best with the edges of the cut-out area. 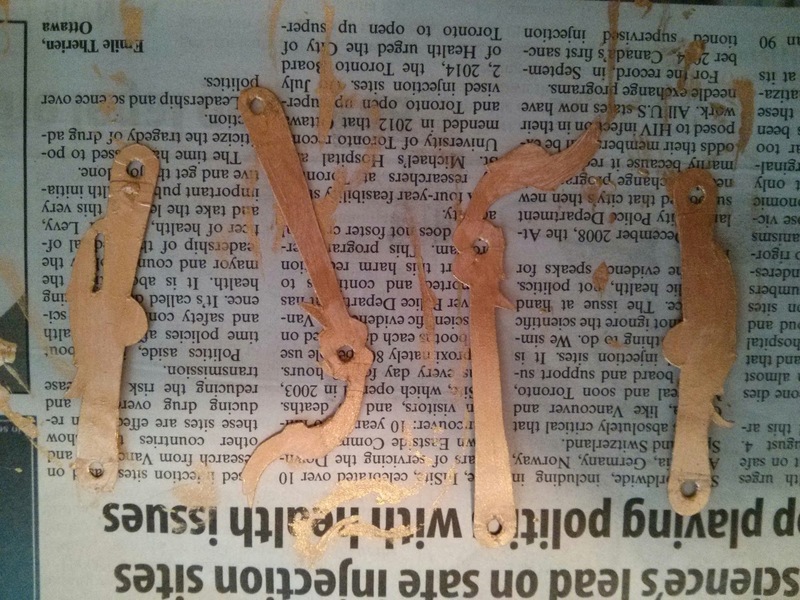 I glued them in place with PVA glue. One nice thing about being married to an artist is that I almost never have to buy my own paints. Once the doily pieces were all in place, I painted the puppet black and gold, and then (taking another suggestion from That Artist Woman) sprayed all the pieces with three coats of Mod Podge, the sealant beloved by Pinterest crafters everywhere. I used the spray kind so that it wouldn't gum up the doilies and block light from getting through the holes. 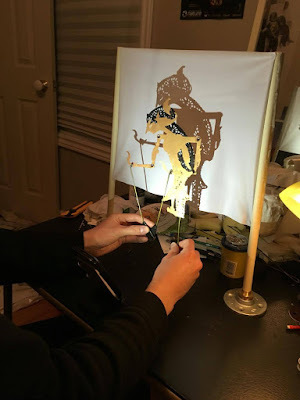 I attached the body parts together with joints I cannibalized from a shadow puppet kit that my friends Charles and Pixie got for me in Turkey. The control rods were made from my old standby, coathangers. I used pliers to bend the rod for the body into the proper shape and hot-glued it into place. 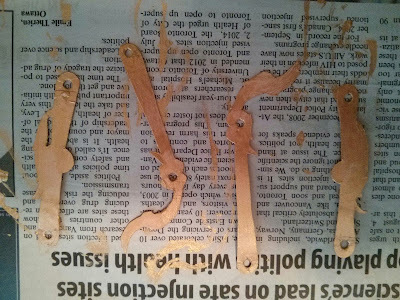 I epoxied the ends of the arm rods to the wrist joints so they could rotate a full 360 degrees, as is typical for these puppets. To make the other ends of the rods easier to hold on to, I bent them around and covered them in electrical tape. At the same time, I built a stage to perform her on. It was good that I built the puppet and the stage concurrently, because then I could tailor them to each other, continually adjusting the height of the shadow screen and the length of the puppet's rods until they worked perfectly together. My bear colleague Katya Vetrova, who has done a lot of shadow work, suggested a shower curtain as the screen. I was going to use a big cardboard box to make a more traditional shadow puppet stage, but since portability is essential, I came up with a stage that could simply be rolled up for transportation. The screen is supported by two vertical pieces of PVC pipe, leftover from some abandoned project. I tried a few things to hold the pipes up, but ended up going with my Dad's suggestion and getting some heavy pieces of metal designed for plumbing. 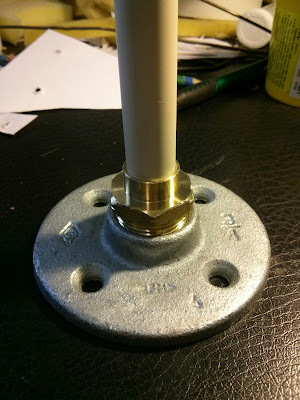 The PVC pipe fits snugly inside the brass piece, which I've permanently screwed into the galvanized pipe flange. No danger of this falling over! I got a white vinyl shower curtain, cut it to size, ironed it flat (with a dishtowel between the iron and the vinyl! ), and hot glued its left and right edges to the two pipes. In this picture you can see the stage in use. Sitting on the table between my arms is a plastic cell phone stand, on which sits my cell phone with its flashlight function turned on to provide the illumination. When not in use, I slip the pipes out of their metal bases and roll up the screen like a scroll. And now I'm all set. With the lights off, the picture at the top of this page shows what the kids will see. Much better than a photograph. About a year and a half ago, I shared the trailer for my friend Pixie Cram's short film Joan, an impressionistic retelling of the story of Joan of Arc. Joan/Jeanne from Pixie Cram on Vimeo. Pixie made Joan during an artist residency at DAÏMÔN centre de production in Gatineau, Quebec. The whole film is stop-motion animation, even the parts with live actors (a process called pixilation). 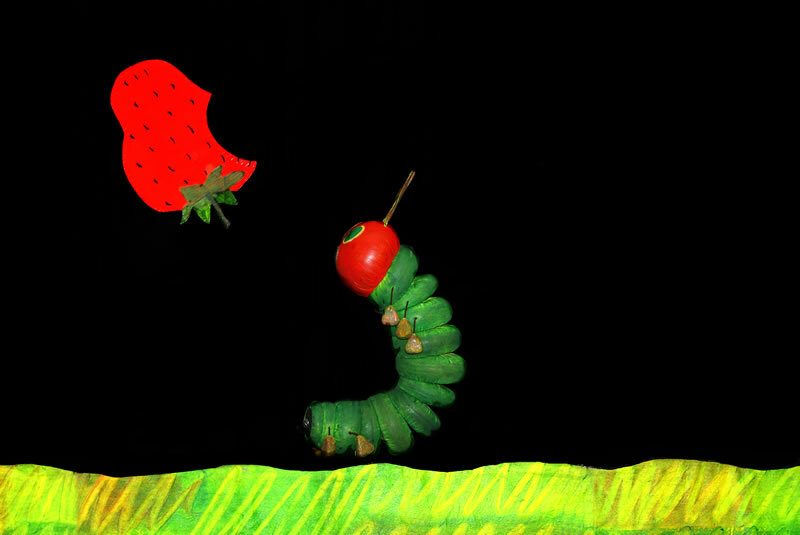 The visual style was inspired by paintings. I assisted with a few of the shots, including the candle flame and the pomegranate, and I played the role of the cleric. I also made one other special contribution. It was winter, and one day on my way to the studio, I slipped on the ice and cut my hand. When I arrived, I asked Pixie if she had a Band-Aid. She said "Yes, but first, can I film your bleeding hand?" I said sure. So when Joan has her vision of stigmata, that's my hand -- and that's real blood! 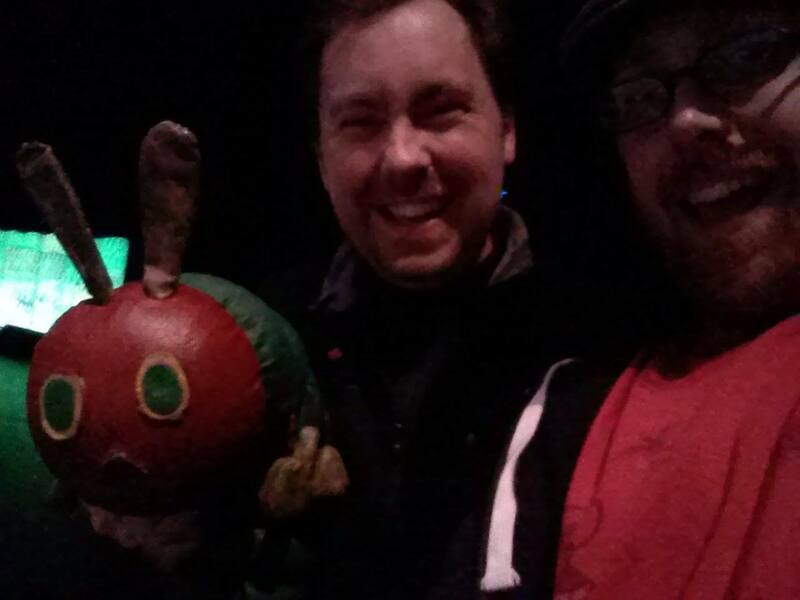 For more behind-the-scenes information, check out this great interview Pixie did with Ottawa Indie Fest. This past summer, Pixie shot her next film, the post-apocalyptic Pragmatopia. I didn't help out with that one, so I can't wait to see it! 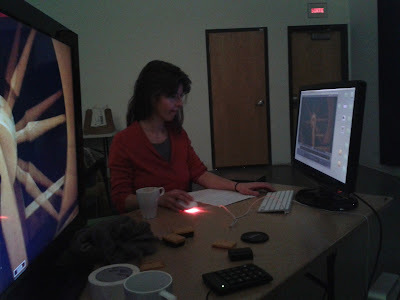 The bear play continues to move forward, albeit very slowly since everyone involved has multiple projects on the go. This past summer I did a couple of experiments, both based around the idea of wearing a bear on my hand like a glove. For the first one, I tracked down a black bear Beanie Baby and dissected it. (Some might call this sacrilege, but our country's economy went off the Beanie Baby standard years ago.) It was almost exactly the right size, though I had to safety pin a few things to get it to fit my hand exactly. 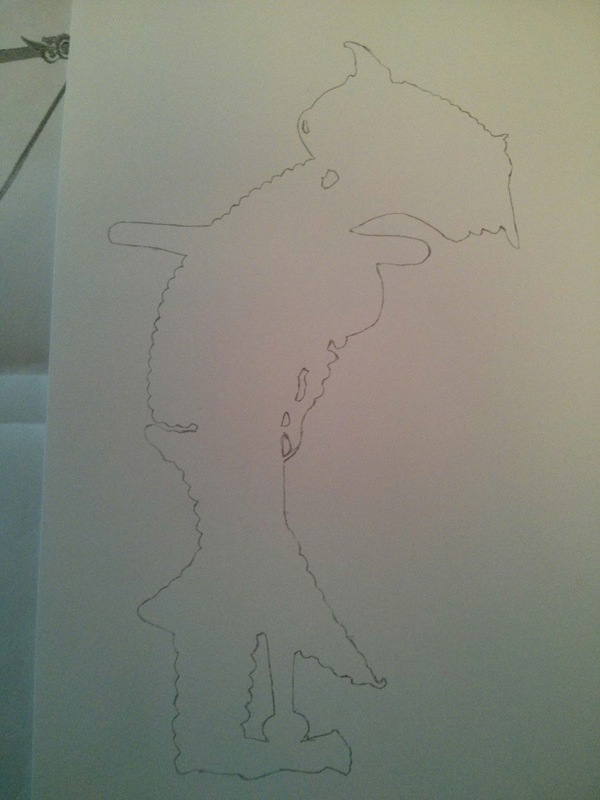 The top hat is a mock-up made of Bristol board.